"Lsc's Miniature & Toy Boxer, Standard"
PLEASE NOTE: Boxers come in many different shapes and sizes. Therefor you can have two dogs that are the same height but weigh 5-10 lbs difference. We PRIMARILY go by height the puppy is expected to be with an estimate of the weight as that will very per the build of the dog. A Miniature Boxer should strongly resemble the larger version of the breed. They should at least be 50% Boxer. 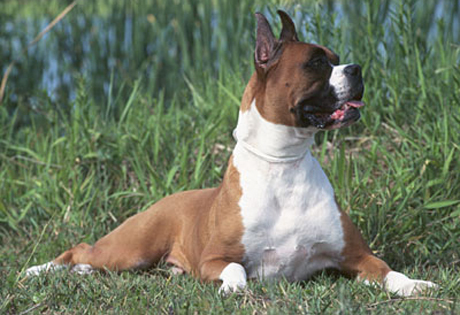 25% Boxers can be considered as breeding stock as well as long as they are being used to breed for higher percentages. They can have, up to 25% Pug, 25% Beagle, and up to 50% Boston terrier, not to exceed 50% total Pug, Beagle, Boston combined. Other breeds may also be included in the future to broaden the gene pool. The size must not exceed 20.75 " at the shoulder. Which is just under the breed standard for pure bred Boxers. The preferred size is between 30-45 lbs and 16-18" tall. The miniature version of the Boxer should have all of the positive traits of the standard Boxer such as gentle disposition, playful, family friendly, fun, outgoing, loyal, willing to please, easily trainable, and of course those big beautiful brown eyes. Careful selection of good tempered, healthy lines should be chosen to eliminate any negative health issues. Also dogs with the preferred Boxer traits should be used to keep this a calm but playful mix that not only "looks" like a Boxer but is in essence a Boxer in every sense of the word except for its size. The Toy Boxer has the same breed standard as the mini except It's size is under 16 inches tall and primarily 30 lbs or less It also can have up to 75% Boston terrier, and as little as 25% Boxer. Pug, Beagle, Bulldogs and other breeds can not exceed 50%. Did you know that boxers make phenomenal hunting dogs? The article states that the Brabanter Bullenbeisser was thehunting dog of choice back in the 19th century, and the dogs could take on any just about any animal in any hunt. The hunting boxer eventually replaced the Brabanter Bullenbeisser, as they are “a lot easier to train”. Boxers are notoriously great with “teamwork” and are fiercely loyal and obedient to their owners. WHAT AKC HAS TO SAY ABOUT THE BOXER. Developed in Germany in the 19th century, Boxers were originally used for dog fighting and to run down and hold large game such as wild boar and bison until the hunter could arrive. The breed is known for standing up on its hind legs and batting at its opponent, appearing to box with its front paws. Imported to America after World War I, they began to grow in popularity in the late 1930's. One of the breed's most notable characteristics is its desire for human affection, especially from children. They are patient and spirited with children, but also protective, making them a popular choice for families. The Boxer requires little grooming, but needs daily exercise. If you are considering purchasing a Boxer puppy, learn more here. Colors you will see from our dogs from time to time. Adult males 23 to 25 inches; females 21½ to 23½ inches at the withers. Proper balance and quality in the individual should be of primary importance. We will have puppies that will be 21 inches at the shoulder & under. We may have some as small as 12 inches at the shoulder. Size will very from litter to litter. Weight will very as some dogs will be more slender and others will be more stocky. Our goal weight however is 45 pounds or less. NOTE: ANYTHING from 16 inches tall and under the AKC standard of 21.5 in is a miniature. Anything from 14.25 to under 16 inches tall is a TOY.There is NO WEIGHT LIMIT: As different builds in dogs will create different weights.